Panama City is the capital of Panama and is the largest city in the country with about 1.1 million inhabitants. It is the economic heart of the country and located at the Pacific coast near the Panama Canal. People have been living here since almost 500 years ago. Nowadays the skyline is comparable to some of the cities in the United States with high-rise office buildings and apartments. There is however an old quarter (Casco Viejo) which is the main focus point for travellers wanting to see the historical buildings in this part of town. Old Panama is on the UNESCO World Heritage List as well. The city has a wide range of places to stay and excellent nightlife if that is what you are looking for. 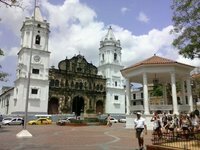 From the capital, you can easily explore the rest of the country with good connections by plane and bus to most of Panama. El Cangrejo/Area Bancaria (banking district) - Probably the best and safest neighbourhood in the whole of Central America. Packed with Bars and Restaurants (Via Argentina, Calle Uruguay, Via Veneto) and hotels like Continental and Marriott, this neighbourhood is forming the rich centre of Panama City. This is the area to stay if you want to be close to everything and if you enjoy walking around 24 hours without being scared of being mugged! Calidonia and Avenida Central (shopping street) - This area could be considered as the poorer centre of the city. Nowadays, the Municipality of Panama has a restoring project in the area for improving the conditions of pedestrians and making it safer. It is a typical Central American neighbourhood packed with ridiculously cheap department stores. Also home of some low key and middle class hotels. Be aware of pickpockets during the day. It is not recommendable to walk around at night as it tends to get dangerous after 9:00pm. Casco Viejo (old town) - UNESCO World Heritage Listed (see below). El Chorillo, Curundu, San Miguelito - Stay out of these areas as violence is very common there and these neighbourhoods are the home of more than 50 different Pandillas (gangs) who are fighting their territory and are not afraid of mugging anyone! Located on a peninsula, the Casco Viejo area is on the UNESCO World Heritage List and is an area packed with nice colonial (in part recently restored) buildings dating back to the time when the Spanish had to set up Panama in a new place after Panama Viejo was destroyed by Pirates lead by bad guy Henry Morgan. There are beautiful views from here (Las Bovedas) over the Causeway, the bridge of the Americas, the boats which are waiting for their pasage through the Panama Canal and the skyline of the city. Be aware that it is located next to El Chorillo, probably the most dangerous neighbourhood in Panama City and therefore make sure that you do not walk in the wrong direction. Nevertheless during daytime there are usually no problems due to heavy police presence. Not recommended at nighttime to walk after Calle 13. During the night, there are many restaurants and pubs to enjoy them. This festival is held 40 days before Easter, the start of lent, and would coincide with other ‘Mardi Gras’ celebrations held around the world. The Panamanian Carnival is special as every day has a theme: Friday is the grand opening, Saturday is international day, Sunday is ‘Pollera’ day, Monday is costume day, and Tuesday is the Queens day. Wednesday early morning is the final day where the ceremonial act of "El entierro de la Sardina" (The sardine burial) takes place. During these Carnival days, Cinta Costera is in the main place where you can enjoy the carnival in Panama City. Dance! It’s the name of the game. This is a funky urban music festival held in Panama City, in the old district of the city called Casco Antiguo. It is an outdoor festival and features contemporary performances and art installations around the district. It is held in December every year. Held during Easter week, this festival is celebrated all over Panama. During this time you will see spectacular parades through the streets telling the biblical story. Depending on the town or city, the festival lasts up to five days, finishing on Good Friday. The Republic of Panama will receive young pilgrims from all over the world on World Youth Day on January 27-29, 2019. Pope Francis will come to Panama City to address and his message of peace in this event. Panama was chosen as the host of the Central American Region because of its great infrastructure. More information in World Youth Day. Panama City has a tropical climate with the temperature varying between 27 °C and 33 °C. Typical to tropical climates, Panama City has two seasons, a dry one and a wet one. The dry season, considered summertime, lasts from January to March and the wet season is from April through December, with the wettest months being October and November where average rainfall is above 230 mm. Typically the other wet months see an average rainfall of between 80 and 150 mm with April and December falling on the low end. During the wet season there is not necessarily non-stop rain for days on end, but it usually rains at least once a day, usually a heavy shower or two. Copa Airlines is the national carrier of Panama with its base at Tocumen International Airport (PTY) near the capital Panama City. Copa and others operate services to most major cities in North, Central and South America and direct flights from Amsterdam, Madrid, Paris, Frankfurt, and Istanbul. About twenty airlines have flights to Panama City. Air Panama offers flights to Panama at Albrook - Marcos Gelabert International Airport (PAC) from Cartagena, Medellin, Armenia (Colombia) and San José, Costa Rica. Panama Pacifico Airport (BLB - former Howard Air Base) receives flights of Viva Colombia and Wingo from Bogota, Cali, Medellin, Cartagena and San José, Costa Rica. Air Panama offers flights to about 20 domestic destinations, including Bocas del Toro and David. Copa Airlines only offers flights between Tocumen and David. Bus: several public bus routes link the airport and downtown Panama. Taxi: taxis are available with pre-purchased fare. Shuttle: some hotels offer shuttle service. Car: rental cars are available at the airport. Panamá Canal Railway Company has a scenic train route between Panama City and Colon. It's mostly a freight train, but it has a very nice passenger car. The train ride offers excellent views of the Panama Canal and the tropical rain forest. In a way it is the only "transcontinental commuter rail line" in the world as some people live in Colon and work in Panama City or vice versa and commute using this train. Well maintained roads lead from Panama City mainly north towards Colon and west towards David and Costa Rica. The east, roads are not as good and note that you can not cross into Colombia. There are several bus companies providing from The Great National Transport Terminal at Albrook a daily bus service from San José, Costa Rica, to Panama City such as Tica Bus. There are also several companies serving either the route to Paso Canoas at the Costa Rican border (Panachif), or David (Utranchiri) (US$15.50). Other destinations include Bocas del Toro, Colon, Santiago, Penonome, El Valle, Chitre, Las Tablas and the western edge of the Darien Gap. Other routes are travelled less frequent and some buses are slow and unreliable. There are connections between Panama City and the Pearl Islands, south of the city. Also Taboga island is connected by boats. Car travel in Panama City is notoriously difficult. During weekday work hours, traffic jams are continuous. Many street intersections lack traffic signals creating right-of-way confusion. Short distances may be quicker on foot or other means of transportation. During holidays like Carnival the traffic can be expected to be worse. One of the easiest ways to get around town is by taxi. Taxis do not have a meter. Fares are around $1.25 for travel within one zone, and the longest fares within the City at about $5. Keep in mind that the former Canal Zone is in a different section, and it will be at least a $5 fare. The surcharge for additional passengers should be $.50/additional passenger, and there's also a small surcharge if you call a cab first. A taxi to or from the international airport typically costs $30 plus tolls if you take the Corredor Sur highway. A taxi to the Amador Causeway costs between $5 - $10. Cab drivers do not expect tips, and they may pick up additional passengers along the way. The Panama Metro (El Metro de Panamá) started on March 5th, 2014. Line 1 has been planned with a mostly north-south route, from San Isidro to Albrook Bus Station and airport, and is 13.7 kilometres long. The Metro includes 14 stations, of which 8 are underground and 6 elevated. Line 1 takes about 23 minutes and cut travelling times dramatically across much of central Panama City. Line 2 of The Panama Metro is under construction in the east direction and wiil connect with Tocumen International Airport. Some stations on this line will be ready before the start of the World Youth Days and the visit of Pope Francis in January 2019. The remainder of the stations will open some months later. Getting around by bus is also cheap and convenient. Fares are $0.25 and the destination of the bus is written across the front windshield in large letters. Still, there are some private buses and drivers usually compete with each other for passengers. For this reason, those buses have colorful decorations to attract customers. During rush hour some buses can get crowded, and it is not unusual to see 3 people seated on a 2-person bench and lots of people standing along the aisle. Those buses are operated by some unions with some routes. The MetroBus buses do not accept cash, so make sure to buy a fare card at one of the city's many malls before using them. Bus fare is $0.25 for regular route and $1.25 for Corredor Routes (Corredor Norte and Corredor Sur) and the same prices for transfer. You can buy and recharge MetroBus card at many places around the city. Much of central Panama City and the Old Town can easily be explored on foot. Getting between the two requires a longer walk, but it's a pleasant one along the boulevard and water. There are several places to rent bikes, which makes for a faster and more convenient way to get between Old Town and the central new areas. Being a relatively cosmopolitan city, Panama is home to a wide variety of cuisine - both native and imported. There are many blogs and websites that review eateries, some catering to upscale and others to more bargain-priced fare. Dine Out Panama has some well written reviews and a wide range of restaurants covered. Visit "Calle 50" to encounter a multitude of great local restaurants, as well as some American favorites such as Hooters. On Calle 50, be sure to stop at Athen's Pizzeria. The pizza is made in a unique way compared to American pizzerias, and the food is fantastic. It's also very affordable, and the service staff is friendly. There are several cafes along Via Argentina. The Spanish sandwich shops offer excellent sandwiches, coffee, and churros. Try Manolo's Churreria (don't miss the churros rellenos, pastries filled with dulce de leche and rolled in sugar) or Del Prado. Sandwiches should cost from $3-$5. Also on Via Argentina is El Trapiche, serving traditional Panamanian food for under $12/person. They serve excellent breakfast food. There's an abundance of Chinese restaurants, and some can be very affordable. Try some around El Dorado, they should be pretty authentic. Niko's Cafe has several locations around the city. Owned by Greeks, they are all open 24 hours and they have a good selection of sandwiches and hot food served all day long. Don Lee is a Panamanian chain serving Chinese fast food, and definitely worth a try. Doraditos Asados in Chanis. An extremely popular Panamanian restaurant that's always full and can take an infuriating amount of time to order. That said it's likely always filled by locals because the prices are cheap and the food is extremely good. In particular the rotisserie chicken (a full one costs about $5) is a local favorite with two types of chimichurri to choose from. Fish market outside of Casco Viejo. Entering Casco Viejo there's the main fish market for the city exists and has recently undergone some refurbishing. There are some restaurants upstairs where the fish is obviously very fresh and the prices are cheap. Restaurante Poly (Corner of 26th and Avenida Sur) A very crowded, noisy and not very hygienic restaurant, it's however a truly gastronomic experience. Do not miss the delicious fish soups and the bistec picado, both for under $2 each. Lung Fung, on Transistmica Avenue. Serves some of the best Chinese food in the city. It will be a different experience. Try dim sum any day of the week (expect long lines on weekends), although it has lost some of its charm now that the wait staff speaks such good Spanish instead of only Cantonese or Haka. Marbella. A very old school Panamanian restaurant on Balboa Avenue. It's a Spanish place specializing in seafood. Excellent paella and overall good seafood. Prices are stuck in 1984, so a hearty plate of paella will set you back $13, and there's only one item with a higher price on the menu. Van Gogh. This nice little Italian restaurant is right near the Via Venteo Casino. It has great food, great service, and a great atmosphere. It is one of the best Italian restaurants in Panama City. Capital Bistró Panamá, Calle principal de San Felipe, Local 1. Kitchen opens 6:30PM. Amazing views of the city's skyline. Chillout music and large sofas on the upper terrace. $18-28. Manolo Caracol. Is an excellent restaurant in the Casco Viejo that serves tapas. Each day the chef invents a new fixed menu with seasonal ingredients. Meals are $30 without drinks. Puerta De Tierra. Another excellent restaurant in the Casco Viejo. The restaurant is primarily a steak house but has some very appealing appetizers also. Ten Bistro. Calle 50 and in Multiplaza Mall is another excellent choice serving contemporary cuisine. Casa Del Marisco. Seafood restaurant located in the banking area walking distance away from the Marriott. The food here is quite good but also pricey. Sake. On the ground floor of Torres de las Americas office tower by Punta Pacifica hospital, is Panama City's hottest sushi restaurant. Probably the best sushi in the city but the city is not known for its sushi. If you're only here for a short while and not desperate for a sushi fix, there are better options for the price. Miraflores Restaurant (Atat the top of Miraflores Visitor Center.). The terrace section overlooks the Panama Canal and tables are most likely reserved in advance. Buffet is around $30 without drinks. It is open from 10AM to 10:30PM (much after the visitor center is closed), so if you need to see the canal late night (and can afford to spend extra for dinner), Miraflores restaurant is the place to be. (The Miraflores Lock opens both way in the night, so you are definitely going to see a couple of ships pass by). Calle Uruguay is a neighbourhood filled with bars and discos for wealthy Panamanians and foreigners. Buy and try some Panamanian and Cuban coffee while you're here. It will be some of the best you've ever had. La Casona de las Brujas, Casco Viejo. An interesting bar on an inner courtyard of a building, attached to an art gallery in Casco Viejo. Lives bands play a variety of music styles. Taberna 21 is a local hangout serving great cheap beer and Spanish tapas. Jungla House Hostel and B & B (El Cangrejo (Modern City Center)), Calle 49 a Oeste y Via Argentina, RINA building #11 (Via Argentina last left, building on left next to Dermocenter, 3 building before Hotel Las Huacas), ☎ +507 214-8069, +507 6668-5076. Check-in: 13PM, check-out: 11AM. "Tree Top" level rooms overlook the hotel/casino district of the city. Dorm rooms and private rooms come with and without AC; communal area with TV, movies, free internet with decent wireless signal throughout facility. Walking distance from bars/clubs, restaurants, shopping, casinos, and supermarkets. VIP entrance for the guests in several of the city's clubs. There is a huge communal kitchen. Equipment rental for excursions, airport transfers and reputable boats to Colombia through San Blas can all be arranged. Mirador Adventures (www.miradoradventures.com) tour office on site. $12-14 per person (dorm beds), single $35, double $49. Luna's Castle Hostel, Calle 9na Este, ☎ +507 262-1540. Set in a Spanish colonial mansion built upon the water´s edge in Casco Viejo, Luna´s Castle Hostel attracts those who seek the ideal Panama City backpacking experience. Amenities include a modern communal kitchen, free breakfast, free coffee, the legendary movie theatre, a spacious outdoor courtyard, free internet, and sweeping views of the Bay of Panama and the modern city skyline and a great social atmosphere. Information is also available for sailing boat departures between Panamá and Cartagena in Colombia. These rooms above the bar are loud! They don't take reservations for privates and it's a popular place, so be prepared to find an alternative. Dorm bed: $13. Voyager Hostel. The air conditioning doesn't work well because of missing window panes. The employees hog the TV and watch Mexican soap operas during the day and soccer games at night. Dorm $9.90. La Casa de Carmen, Calle 1a de Carmen 32. This hostel is in a cute house located on a busy street. Try to get a room further in the back to get away from the traffic noise. Breakfast is included, which involves toast, cereal, coffee and orange juice. Two computers with internet access are also free for guests. Accommodations are clean and spacious. $30-45/double. Hostel Mamallena, Casa 7-62 Calle Primera, Perejil, ☎ +507 6676 6163, e-mail: mamallenapa@yahoo.com. Information is also available for sailing boat departures between Panamá and Cartagena in Colombia. Dorm $12, double $29.50. Hostal Miami, Avenida Central 18-18. Shared kitchen, internet and Wi-Fi. Friendly employees. Dorm US$13, private rooms US$30-$50. Casa Rica (formerly Zuly's Backpackers). Hostal Urraca, Calle 44, No. 2-112, Bella Vista, ☎ +507 391-3971, e-mail: book@hostalurraca.com. A Peace Corps hangout. Dorm $16, private rooms $22. Las Vegas Hotel. Suites are clean, safe, centrally located and relatively affordable. There's also a nice little Italian restaurant and a wine bar attached to the hotel. Casa Las Americas. There are six rooms in this very nice Bed & Breakfast in Betania. You cannot beat the location for peace and quiet in a lush setting. There is a large pool and lovely terrace with a city view. Centrally located and easy access by inexpensive taxi to shopping, restaurants, and proximity to the sights of the city. Also a big plus -- the pool is large and lovely, very quiet and private and surrounded by lush greenery. $60-105. Magnolia Inn - Casco Viejo, 818 Calle Boquete (Calle Boquete and Calle 8va in Casco Viejo, behind Plaza Catedral), ☎ +507 202-0872. Check-in: 1PM, check-out: 11AM. Magnolia Inn offers comfortable and spacious deluxe private rooms as well as luxury hostel rooms. The restored French colonial mansion is full of historic character, as well as modern conveniences such as A/C, orthopedic beds, free Wi-Fi Internet and safe deposit boxes. The Inn has a stylish social areas to relax and meet fellow guests. A fully equipped kitchen and sunbathed dinning room is available for guest use. $80-135. Tribe Panama. In historic Casco Antiquo (Viejo) on Plaza Simon Bolivar; there are 4 suites with each having two bedrooms, living room, kitchen, and wonderful views of the sea and Plaza Simon Bolivar. There are over 20 restaurants and Bars within walking distance. Free internet and satellite TV. The building sits across the street from the Presidential Palace grounds which provides for the best security and neighbor that Panama has to offer. $120-160. The Bristol Hotel, ☎ +507 264-0000. Luxurious modern hotel in the heart of Panama City. Outstanding bar and restaurant on site. First-class service. $200/double. The Canal House, Calle 5 and Avenida A in Casco Viejo, ☎ +507 228 1907. An intimate hotel in a Colonial mansion in the heart of Panama City's historic district. The Canal House was selected by the New York Times as its Editor's Pick for Panama City hotels and is the country's first Green Globe Certified Hotel. The Canal House has three rooms and a staff of six, including two English speaking managers. It is located just to the side of the Canal Museum, walking distance from some of the city's best bars, restaurants and cafes. From $180. Las Clementinas Chambers, Café & Bar, Calle 11 and Avenida B in Casco Viejo, ☎ +507 228-7613 (Panama), toll-free: +1-888-593-5023 (US and Canada). A small boutique hotel in Panama's exciting historic district, Casco Viejo. Las Clementinas has just six rooms, each of which is a full apartment with kitchen, 12-foot ceilings and wrap around balconies, some with plaza views, some with ocean views. Above the rooms is a rooftop terrace with stunning views of Panama City, the Pacific Ocean, the entrance to the Canal and the rooftops of the historic district. Below the rooms is the Cafe & Bar. Las Clementinas is managed by the Canal House and leisure and business travelers. InterContinental Miramar, Av. Balboa, ☎ +507-206-8888. Luxury high-rise hotel overlooking Panama Bay. Facilities include upscale dining, large swimming pool, tennis courts, full-service marina, helicopter landing pad. Panama Marriott Hotel, Calle 52 y Ricardo Arias, Area Bancaria Panama City, Panama, ☎ +507 2 109100, fax: +507 2 109110. Luxury 20-story hotel in the financial district. Courtyard by Marriott Panama Real Hotel, Vía Israel, Punta Pacífica Mall, ☎ +507 301 0101, fax: +507 301 0102. 120 rooms with high speed internet, restaurant, bar, gym, pool, four banquet halls and a meeting room, as well as laundry service, laundry and shop. Prices range between $ 100 - $ 250. Internet cafes can be found in cities and most major towns. Wifi is on the rise though with many hotels, restaurants and bars offering this services, especially in the major tourist areas like Panama City, Bocas del Toro and Boquete. Some mountainous or off the beaten track areas might not have any internet services at all. Panama's country code is 507. All cellular numbers start with the number 6 and have 8 digits. Land line phone numbers have 7 digits. 911 is the general emergency phone number. Calls to the USA and Europe are between 4 and 10 cents a minute. The best way to make international calls from Panama is to buy prepaid telephone cards that are sold at every corner. The most popular is the TeleChip card. If you bring your cellphone, you can choose to buy a local simcard, instead of paying high charges for internet use through your home provider. Correos y Telegrafos is the national postal company of Panama. It provides a wide range of services though you usually have to use the post offices for both sending and receiving mail and packages, including buying stamps. Post offices can be found in many cities and towns and are open from 6:30am to 5:45pm Monday to Friday and 7:00am to 5:00pm on Saturday. Domestic mail takes several days but to the USA and Europe for example it can take anywhere from 5 to over 10 days depending on the country. For sending larger packages or courier sendings, you might also consider using companies like FedEx, TNT, UPS or DHL, as they offer fast, reliable and competitively priced services as well. We have a comprehensive list of accommodation in Panama City searchable right here on Travellerspoint. You can use our map to quickly compare budget, mid-range or top of the range accommodation in Panama City and areas nearby. This is version 64. Last edited at 7:28 on Aug 8, 18 by Utrecht. 80 articles link to this page.